adventures of an almost 40 year old intern...: Yo Gabba Gabba room wrap up! Yo Gabba Gabba room wrap up! I thought I would take this Friday to wrap up the Yo Gabba Gabba/ Habitat for Humanity of Greater LA kids room project! Thanks to everyone for all of the sweet messages and comments regarding my work! I am proud of what I was able to pull off for a super low budget in such a short amount of time (less than a day to tape, paint and dry and install). Sure, there is a lot more I wish I could have done, if given the time. Now I have a taste of what the folks on those HGTV design competition shows go through! The Wildbrain Entertainment folks created the above video, recapping the project, to share with all of their fans. When you see me in it, please keep in mind that I had been hard at work painting, moving furniture, etc in the 14 hours leading up to it being shot after a 5 minute clothing change. It is always hard watching myself on camera and seeing this I know I sure could have used those fab hair and make up gals that glossed me up at the Today Show or Nate Berkus! One project that I haven't touched on yet is the twin sized duvet cover that I made (with the help of my friend Alison and her sewing machine). Yo Gabba Gabba bedding is currently only available in Toddler sized, so I had to make something for the twin bed. Thankfully there are some cool Yo Gabba Gabba printed fabrics available from a company called Hoffman Fabrics. I picked the pink print because it was the most neutral of the designs and because I knew the girls sharing the room love pink! 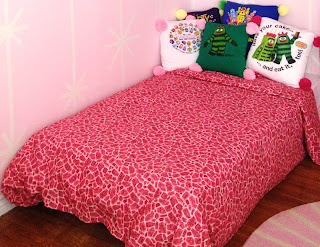 We used 8 yards of fabric to make the duvet cover and a standard pillow case. Super easy... the width of this fabric doubled and sewn together is the perfect length for a twin duvet cover. Then we folded it over, wrong side out and sewed the top and side seam. We left the majority of the bottom seam open to easily slip the comforter inside it. The bed sporting these fine threads was for the seven year old and I like that it is a subtle character print and therefore works well for an older kid. This fabric was also used to make the curtains in the room. The last remaining DIY project is the cool round painted rug in the room. I have painted a lot of rugs before however I usually follow my tried and true method of mixing latex paint with fabric medium on a flat woven Ikea Erslev rug. This one was created using a rug painting kit donated by a company called Vecco. The plush rug is 5' diameter. I watched a quick how to video on their website and then I got to work. 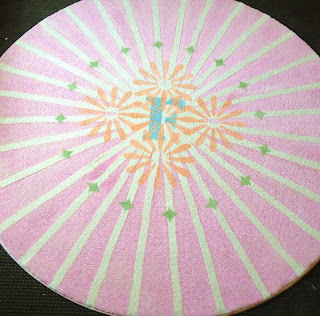 I started with taping a pinwheel design on the rug and then layered the flowers and diamonds using the stencils they provided. I layered a letter F within the design because both of the girls sharing the room have names beginning with F. I used 3 cans of Pink Fizz colored paint, 1 can of Orange Candy, 1 can of Pears in a Pod and 1 of Blue Burst. I then used 4 cans of their sealant to set the colors. The cool thing about the Vecco product is that when you mess up in your design you can vacuum it up and start over as long as you haven't sealed it yet. The rug feels quite a bit rougher in the spots with paint and sealant on it and not as soft as the unpainted parts but still comfortable to walk on. Definitely an easy project to do! For those of you just tuning in and wanting to know more about me you can by going here... and if you didn't already know... I created a facebook page... check it out and "like" it! and follow me on twitter and you can even follow my boards on pinterest too! Great work!. I have never seen such type of project. It is totally new one for me. Thank you for sharing very interesting post.Best essay writing service, It gives easy writing tips for me to write essay papers. Amazing and fantastic ideas i will share this do not worry my friend. Yo Gabba Gabba room reveal!